My reading habits are as arbitrary as anything else in my life. I make a "to read" list, but then I hear a title mentioned on the radio or someone sends a "you've got to read this" email, and I'm off. in addition, my audio book fare depends entirely on supply, and I'm fast working my way through all my first choices at the public library and having to find other sources. I tried to download from audible.com (hearing their TV offer--two free books) but although the website promised I could burn them to CDs, I've ruined enough blank disks to buy at least one audiobook at retail. I find that when I listen, there are big blank spaces in the narrative when I move from one disk to the next. So far I have listened to a large percentages of Sherman Alexie's War Dances and part of Joshilyn Jackon's Backseat Saints. I just gave up until I can find the actual book. I did listen to Amy Bloom's Where the God of Love Hangs Out, a short story collection, and then I found that one of her stories from that collection was included in the new edition of our literature anthology. I also somehow picked up Falling Apart in One Piece by Redbook editor Stacy Morrison, an account of the end of her marriage when her son was just a few months old. It wasn't the kind of book I intended to read, but I did glean a couple of good phrases from the book. She said at one point ,"I like to live life out loud." I understood that impulse completely. My favorite quote, though, was this: "Life is hard. Life is good. These two truths are in no way related." Meanwhile, after reading high praise of author Charles Portis in Oxford American magazine, I rounded up a copy of True Grit. Since a remake is in the works (with Rooster Cogburn played by Jeff Bridges, I hear), I thought it was high time I read the real thing--told from Mattie's point of view. I was also tickled to hear that Ron Koertge had written a follow-up novel-in-verse to Shakespeare Bats Cleanup, this one called Shakespeare Makes the Playoffs. This one follows Kevin Boland, a middle school boy who loves baseball but also keeps a secret poetry journal, which he finally begins to share a little. In the first book, Kevin is home sick with mono right after his mother's death from cancer. Now in this second book, his father has begun to date, something Kevin is not quite ready to accept. He also finds himself torn between his girlfriend Mia and Amy, a kindred spirit he meets at a poetry reading with his dad. I love the way he uses his journal to experiment with poetry forms as he writes about his day-to-day life. I first fell in love with Koertge's adult poetry, and then I heard him present at an English conference and discovered his YA lit as well. Now I'm trying to keep up with school reading, while also balancing Mark Twain's Innocents Abroad, an unlikely book club pick, and Adam Ross's Mr. Peanut, a recent Lemuria First Edition Club choice. I'll report back soon. I've also been skimming and scanning my bookshelves, trying not to overlook great resources. For example, at the English convention last fall, I bought a copy of Gareth Hinds Beowulf. It's an abridged account with exquisite artwork, something like a graphic novel--maybe just more graphic. I'm also locating John Gardner's Grendel and Seamus Heaney's lovely translation, which features the original Old English text on the left and his line-by-line translation on the right. In my freshman lit class (Literature-Based Research), I am searching through the newest edition of our anthology, Michael Meyer's Introduction to Literature (Bedford), to see what fresh material I might select this time. The textbook is huge, and I realize that in a Tuesday/Thursday class with only an hour and fifteen minutes each time we meet, I can't begin to have them read all I wish I could. I have tried to take to heart, though, a common last year: "Mrs.Posey, are we ever going to read any happy stories." I am looking at the selections that have been added, the ones I have overlooked before, even the chapters that focus on humor, incorporating those into my syllabus. Why not? I know that I love humor in my own reading selections. With that same idea, I am searching for writing models for my Expository Writing class, also looking for some with a humorous angle. Some of the most memorable pieces I've read will fit perfectly. I've found "The One-Eared Intellectual" in Bailey White's collection Mama Makes up Her Mind, and I have my eye out for a Woody Allen piece I remember from an old Literary Cavalcade magazine called "If the Impressionists Had Been Dentists." In the meantime, I'll keep reading for pure pleasure, dropping little hints to my students. "Let me tell you about this book I'm listening to on the way to school. . . ." Who knows? They might be interested too. With school starting back Monday, I know that much of my autumn reading will consist of textbooks (At least I teach literature. Calculus books would be unbearable for me.) and student papers. Of course, anyone who knows me knows that while my school responsibilities may slow my pleasure reading, they never stop it altogether. What a hypocrite I would be to teach people the purpose and pleasure of reading and writing if I didn't do them myself. One of my last books I read this summer was also one of the best. David Mitchell's The Thousand Autumns of Jacob De Zoet came highly recommended by a reading friend who was only a hundred pages in and "already hooked." Mitchell's story is set on an Dutch-settled island separated from Nagasaki by a bridge at the turn of the nineteenth century. Jacob De Zoet has signed on for a five-year stint with the Dutch Indies company, hoping to make his fortune and to return to marry his beloved Anna. Politics--not only between the Japanese and the Dutch but among the Dutch colleagues as well--continually frustrate his hopes and opportunities. He develops relationships with an aging doctor who teaches medicine and with an interpreter, and he becomes fascinated with a young Japanese woman, a doctor's daughter with a burn scar over half her face, ruining her chances for a good marriage. From the beginning, DeZoet feels protected by the lucky family Psalter, a bullet still firmly wedged into its cover, that has passed to him from his uncle, a minister. Since any material of a Christian nature is strictly forbidden, he must keep it hidden. He finds protection from one or two people who choose to look the other way, particularly since he has in his possession other books of genuine interest, especially to his friend the interpreter. Mitchell's book is set on the brink of change in the world. Japan is still clinging to isolation and tradition. The Dutch have passed their peak, much to the surprise of those who are stranded by the edge of Nagasaki, and the British and Americans are gaining power in the world. This is no casual beach read or page-turner thriller (although I'll admit I read it on the beach.) At first, I found it difficult to distinguish the characters. This is the point where I would tell my students to make a list with notes. The attention required, however, is worth the mental effort. I loved the book, and I loved its protagonist, its hero, Jacob DeZoet. No, I am not weighing in on the controversial decision of the YMCA to drop their other letters in their ads and signage. I'll let the Village People handle that. I have just been thinking about the arbitrary division between Adult Fiction and Young Adult Fiction. As much trouble as I have organizing my own book shelves, creating something that borrows from but does not emulate either the Library of Congress method or the Dewey Decimal System, I cannot imagine how difficult it must be for publishers to decide how to market books and for book store owners to decide how to shelve them. In the "Young Adult Fiction" category, tracing back to S. E. Hinton's The Outsiders, some books seem to fit neatly....My Darling, My Hamburger, for example. At other times, though, books seem to be slotted there at the risk of being missed by a large portion of the reading population. When I was a young adult myself, I fear I might have snubbed anything categorized thus. Back them, I wanted books with heft and substance. What I recognize now is that many YA books have just that. Last week, I got around to listening to a young adult novel recommended by lots of high school students I've taught, Edward Bloor's Tangerine. I recognized it at the library, where I am always scouting for a good audio book I haven't check out yet, and gave it a try. Nothing about the book, on the surface, seems to indicate it as a choice for me: the protagonist is a seventh grade boy. The novel, though, was compelling enough that I found myself listening in the garage or in parking lots, long after it was time to get out of the car. The novel dealt with family secrets and favoritism, sibling rivalry, visual handicaps, soccer, football, class conflicts, and loyalty. Paul Fisher, the main character, was endearing but flawed. The parents were flawed but human. At the center of the story, Paul has lived in the shadow of "the Eric Fisher football dream," since his older brother has the potential for athletic greatness as a kicker, but absolutely no moral character. When a sinkhole damages the excessive number of portable classrooms at his middle school, Paul opts to transfer to the more ethnically representative Tangerine Middle School, instead of going to the late shift at his own upper class school during construction. Here he earns the friendship and even respect of the coed soccer team on which many of the players' families are citrus growers. They face precarious weather and prejudice, but they accept Paul, grudgingly at first, and play a huge role in his maturity. This weekend, I was talking to a group of high school students preparing to return to school this month. That preparation for most of them involves summer reading assignments. I recognized all of the titles and had read most--Of Mice and Men, The Count of Monte Cristo, Cyrano de Bergerac, In the Time of Butterflies, and more. The English teacher in me wanted to say, "Come on! Get excited! These are great books!" 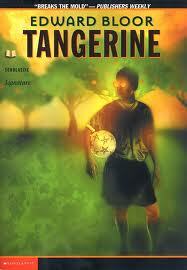 Instead, I just asked, "Have any of you read Tangerine?" And they were off!